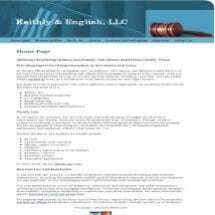 Here at the law firm of Keithly & English, LLC, our mission is to learn and understand our clients' needs and the external factors affecting them so that we can aggressively and professionally represent them throughout the legal process. We clearly communicate our legal knowledge and experience, thereby enabling our clients to make well-informed decisions for themselves. Our approach is to provide a personalized attorney-client relationship based on each client's unique concerns and requirements. Our philosophy is based on the commitment to provide experienced advice to our clients. We are dedicated to full value for every dollar invested in legal services. Our clients can expect prompt personal service and uncompromising, quality legal representation delivered in a cost-effective manner.